Preface: The IPv4 range below is from RFC5737 which is not ideal as this range is for documentation purposes, not for live operational use. Equally RFC1918 space is meant for private use and may genuinely be seen inside a routing table so using RFC1918 and/or RFC5737 space maybe misleading. RFC6666 allocates 0100::/64 for use as a range of IPv6 discard prefixes. There is currently no official IPv4 discard range allocated by IANA. In this example AS1 has a static route to 4.4.4.4, the pretend victim IP. 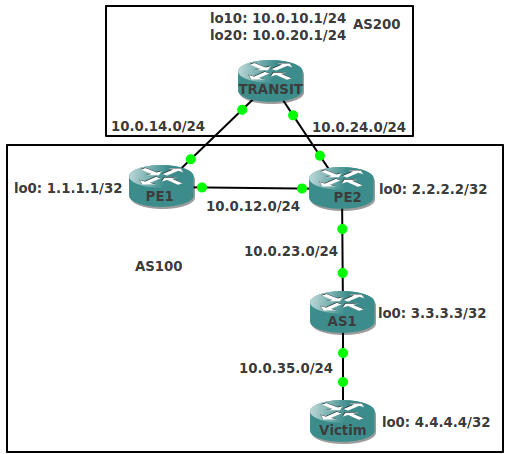 A route map applied to the redistribution of static routes into AS100 iBGP between PE1, PE2 and AS1 on AS1 set the next hop IP to 192.0.2.1, which in turn points to Null 0.